My job is to keep my stretch of the motorway, known as the 1-81, clear in a blizzard. But last January I ‘heard’ an inner voice telling me to leave the section of motorway I was working on , and to get across to the other side of the 1-81, and go in the opposite direction. Answering that inner voice has changed my life forever. 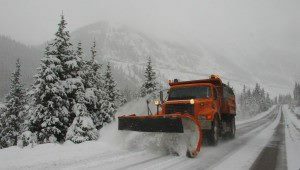 I drive a snow truck for the Pennsylvania DOT. One of those huge yellow dump trucks filled with salt, with a snowplough attached in front. On a January afternoon of 2004 I had gotten the noon to 8.0pm shift. I ploughed & spread salt. One section worried me: at the point where 1-81 and the Central Scranton Exp. I got the truck ready… but something stopped me. What should I do? I was trying to figure it out when I heard a voice inside my head. “Go North”, it said, clear as a bell. I sat still in my truck, straining to hear the message again. “Who is that talking to me?” I said to myself. “Go North,” the voice repeated. Then I did something I had never done before, I exited the highway, entered back on the north side of 1-81 and went back to work, as the voice had instructed. I rolled slowly along the shoulder, doing my work. In front of me, I spotted tyre tracks near the guardrail, peering into the ditch below I saw a tail-light. No one in a car would have seen it and neither would I If I had not had my 10ft high perch! I climbed out of my truck and rushed down the embankment, there was a wrecked car, twisted over a frozen creek bed with the doors flung open and a man wedged beneath the car. He did not even have a coat on. “Please help me,” he said. I quickly put my coat around his shoulders and told him I would go for help. I radioed for an ambulance and then rushed back to sit with the injured man. While we waited for the ambulance we talked and he broke down as he told me “I have a wife, Clare, and four kids. I thought I would never see them again”, he said. This entry was posted in Power of Prayer and tagged miracles, prayer, stories. Bookmark the permalink.